A beautiful Victorian custom made 15kt. 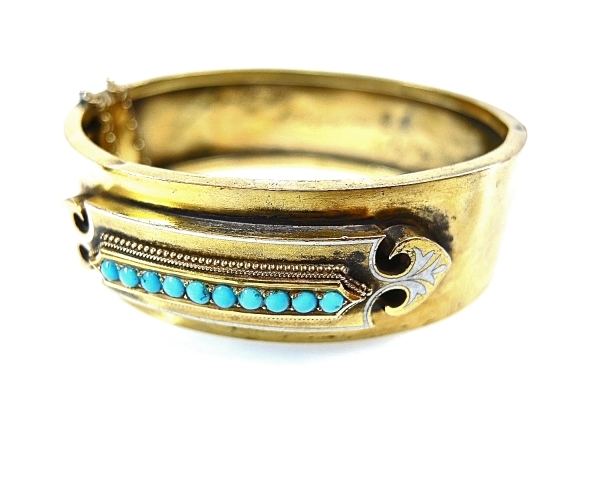 (English) yellow gold bangle style hinged bracelet with 10 bead set round cabochon medium powdery blue turquoise, approx. 2.3mm. There is white enamel trim with fancy leaf like terminals around the frame. " EHS In Memory of RCS" is engraved inside the bracelet.